JetClean is a free registry cleaner that scans quickly and works with just one click of the mouse. Because JetClean is a program suite, it also includes a tool useful for cleaning up Windows junk files, freeing RAM, and more. This review is of JetClean version 1.5.0. Please let me know if there's a newer version I need to review. JetClean is a nice registry cleaner because it's easy to use, works well, and has all the basic yet necessary features. I love that registry backups are made automatically. Some similar programs either don't make any backups or prompt you to do so, but JetClean fortunately does this automatically every time. 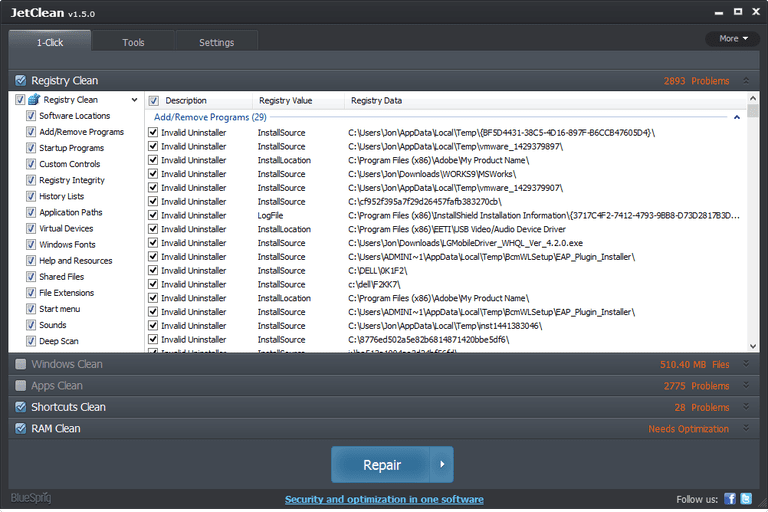 It's also really useful to have a "Scan & Repair" button in JetClean so you don't have to wait for the results of the initial scan and then choose to repair the problems. If you don't need to review the scan results before correcting them, go ahead and choose the Scan & Repair option next to the big Scan Now button, or the other option to have the computer shutdown after the repair. Because JetClean includes more than just a registry cleaner, you unfortunately must deselect the "Windows Clean," "Apps Clean," and other options if you want to scan the registry only. This isn't really too big of an issue because you just have to remove the check mark next to the other sections. It's too bad the portable version of JetClean must be built using the installable version. It's one of just a few programs I've seen that work this way. It means you can't download a portable version separate from the installable one. To get the portable version of JetClean, access the Tools > Portable section of the program and then click Generate.